A macromolecule that acts as a catalyst to induce chemical changes in other substances, while itself remaining apparently unchanged by the process. Enzymes, with the exception of those discovered long ago (for example, pepsin, emulsin), are generally named by adding -ase to the name of the substrate on which the enzyme acts (for example, glucosidase), the substance activated (for example, hydrogenase), and/or the type of reaction (for example, oxidoreductase, transferase, hydrolase, lyase, isomerase, ligase or synthetase-these being the six main groups in the Enzyme Nomenclature Recommendations of the International Union of Biochemistry). For individual enzymes not listed below, see the specific name. /en·zyme/ (en´zīm) a protein that catalyzes chemical reactions of other substances without itself being destroyed or altered upon completion of the reactions. Enzymes are divided into six main groups: oxidoreductases, transferases, hydrolases, lyases, isomerases, and ligases. Symbol E.
allosteric enzyme one whose catalytic activity is altered by binding of specific ligands at sites other than the substrate binding site. brancher enzyme , branching enzyme 1,4-α-glucan branching enzyme: an enzyme that catalyzes the creation of branch points in glycogen (in plants, amylopectin); deficiency causes glycogen storage disease type IV. constitutive enzyme one produced constantly, irrespective of environmental conditions or demand. 2. any enzyme removing branches from macromolecules, usually polysaccharides, by cleaving at branch points. induced enzyme , inducible enzyme one whose production can be stimulated by another compound, often a substrate or a structurally related molecule. respiratory enzyme one that is part of an electron transport (respiratory) chain. Any of numerous compounds that are produced by living organisms and function as biochemical catalysts. Some enzymes are simple proteins, and others consist of a protein linked to one or more nonprotein groups. en′zy·mat′ic (-zə-măt′ĭk), en·zy′mic (-zī′mĭk, -zĭm′ĭk) adj. a protein produced by living cells that catalyzes chemical reactions in organic matter. Most enzymes are produced in tiny quantities and catalyze reactions that take place within the cells. Digestive enzymes, however, are produced in relatively large quantities and act outside the cells in the lumen of the digestive tract. The substance that is acted upon by an enzyme is called a substrate. A protein that catalyzes most chemical reactions in biological systems without itself being destroyed or altered by the reaction; enzymes accelerate the rate of reactions by lowering transition state energy Enzyme Commission groups Oxidoreductase, transferase, hydrolase, lyase, isomerase, ligase. A protein that acts as a catalyst to induce chemical changes in other substances, while remaining apparently unchanged itself by the process. Enzymes, with the exception of those discovered long ago (e.g., pepsin, emulsin), are generally named by adding -ase to the name of the substrate on which the enzyme acts (e.g., glucosidase), the substance activated (e.g., hydrogenase), or the type of reaction (e.g., oxidoreductase, transferase, hydrolase, lyase, isomerase, ligase or synthetase-these being the six main groups in the Enzyme Nomenclature Recommendations of the International Union of Biochemistry). A biochemical catalyst that enormously accelerates a chemical reaction. Enzymes are complex protein molecules highly specific to particular reactions. Almost everything that happens in the body, at a chemical level, is mediated by one or more of the many thousands of different enzymes in the cells, and much of the length of each DNA molecule consists of codes for enzymes. Fig. 149 Enzyme . 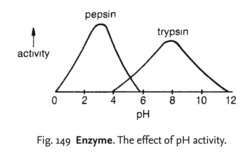 The effect of pH activity. a protein molecule that catalyses a biochemical reaction by lowering the ACTIVATION ENERGY required for the reaction to proceed. Enzymes are usually specific to particular substrates (see ACTIVE SITE) and are sensitive to environmental conditions such as pH and temperature (see Fig. 149, and Q10 ). ALLOSTERIC ENZYMES exist in inactive and active forms, while others can be inhibited by nonsubstrate molecules (see COMPETITIVE INHIBITION, NONCOMPETITIVE INHIBITION). Protein-splitting enzymes (PROTEASES) are produced in nonactive forms in the mammalian digestive system to minimize the risk of self-digestion. For example, TRYPSIN is produced as inactive trypsinogen. A substance produced by the body to assist in a chemical reaction. In carbohydrate intolerance, lack of an enzyme makes it impossible for one type of sugar to be broken down into a simpler form so that it can be absorbed by the intestines and used by the body. n protein that acts as a catalyst during chemical reactions. A protein substance which catalyses (i.e. enhances a chemical reaction in other bodies without undergoing a change in itself) and is formed by living cells but can act independently of their presence. Example: Enzyme preparations (containing pancreatin, papain or subtilisin A) used to break down tear proteins that become attached to the surface of contact lenses. See contact lens deposits; phagocytosis; surfactant; wetting solution. A macromolecule that acts as a catalyst to induce chemical changes in other substances, while itself remaining apparently unchanged by the process. n a protein substance that acts as a catalyst to speed up metabolic and other processes involving organic materials. Some enzymes function within cells; others function in the extracellular fluids and tissue spaces and organs. They are active in all major tissue functions, such as cellular respiration, muscle contraction, digestive processes, and energy consumption, and are produced intracellularly. n a species-specific serologic laboratory procedure used to identify microorganisms infecting or inhabiting a tissue or organ system. Its dental use is in the identification of pathogens involved in periodontal disease. any protein that acts as a catalyst, increasing the rate at which a chemical reaction occurs. The animal body probably contains about 10,000 different enzymes. At body temperature, very few biochemical reactions proceed at a significant rate without the presence of an enzyme. Like all catalysts, an enzyme does not control the direction of the reaction; it increases the rates of the forward and reverse reactions proportionally. one that activates a given amino acid by attaching it to the corresponding transfer ribonucleic acid. several enzymes are important in clinical pathology. Enzymes characteristic of a tissue are released into the blood when the tissue is damaged, and enzyme levels in the blood can aid in the diagnosis or monitoring of specific diseases. Lipase and amylase levels are useful in pancreatic diseases; alkaline phosphatase (ALP), aspartate aminotransferase (AST) and alanine aminotransferase (ALT) in liver diseases; and lactate dehydrogenase (LD), AST and creatine kinase (CK) in muscle disease. ALP is also released in bone diseases. Many enzymes have different forms (isoenzymes) in different organs. The isoenzymes can be separated by electrophoresis in order to determine the origin of the enzyme. Isoenzymes of LD, CK and ALP have the most clinical utility. amylo-(1,4→1,6)-transglycosylase; important in the synthesis of the branched glycogen molecule. Absence of the enzyme causes an increase in the length of the glucose chains and a decrease in the number of branch points in the glycogen molecules. in humans hundreds of genetic diseases that result from deficiency of a single enzyme are now known. Many of these diseases fall into two large classes. The aminoacidopathies, e.g. phenylketonuria (PKU), result from deficiency of an enzyme in the major pathway for the metabolism of a specific amino acid. The amino acid accumulates in the blood, and it or its metabolites are excreted in the urine. The lysomal storage diseases, e.g. gangliosidosis, mannosidosis, result from deficiency of a lysomal enzyme and the accumulation of the substance degraded by that enzyme in lysosomes of cells throughout the body. The stored material is usually a complex substance, such as glycogen, a sphingolipid or a mucopolysaccharide. Many similar diseases are now identified in animals and are to be found under the specific name of each disease. one produced by a microorganism regardless of the presence or absence of the specific substrate acted upon. the smallest aggregate of an enzyme's subunits that has enzymatic activity. dextrin-1,6-glucosidase: an enzyme that acts to move glucose residues of the glycogen molecule, and is important in glycogenolysis. one whose production requires or is stimulated by a specific small molecule, the inducer, which is the substrate of the enzyme or a compound structurally related to it. the effect some compounds such as phenobarbitone and phenytoin have in increasing the activity of microsomal hepatic enzymes. This may cause alterations in the metabolism of concurrently administered drugs. those associated with the endoplasmic reticulum of cells, particularly of the liver. one that catalyzes the hydrolysis of proteins and various split products of proteins, the final product being small peptides and amino acids. one whose rate of production is decreased as the concentration of certain metabolites is increased. enzymes of the mitochondria, e.g. cytochrome oxidase, which serve as catalysts for cellular oxidations. Q. My muscle enzymes are at 355, my DR says normal is 200. She refered me to a Neurologist. What could be wrong? I am experiencing sore legs when I walk, weakness, and sometimes difficulty in swallowing. I am 46 I had a minor heart attack 5 yrs ago with a stent placed in my LAD. I am on Crestor 10mg. my Dr. has adjusted the dosage several times and used other drugs but it doesn't change the results much if at all. A. Crestor itself may cause elevated muscle enzymes (you probably refer to Creatine Kinase, http://en.wikipedia.org/wiki/Creatine_kinase). However, weakness and swallowing problems may raise the suspicion of a disease of the nerves or muscles. For specific enzyme digestion, we adapted the procedures introduced by Collins et al. Everybody inherits two copies of the ADA enzyme gene, one from each parent. Dockery also pointed out that digestive enzyme supplements continue to make up a relatively small segment of the nutritional supplement market in general. The activity of the enzyme was estimated from the rate of absorbance increase at 500nm. To find an inhibitor for MbtA, the scientists designed a mimic of a compound to which the enzyme binds tightly during its normal activity. Enzymes are protein molecules that assist in every metabolic process of the body. There are thousands of restriction enzymes commercially available that can recognize about 200 sequence combinations. This strongly implicated FAS inhibition, as FAS is the only eukaryotic enzyme capable of synthesizing palmitate. 5) on a flatbed apparatus (Multiphor LKB, Bromma, Stockholm, Sweden) indicated that this organism produced a [beta]-lactamase enzyme with a pI of 6. Enzymes are introduced first according to their nomenclature and then by their nature and mode of action. McEwen proceeded to test six of the enzyme contaminants in commercially available hyaluronidase and discovered the active principle of beta-glucuronidase that is now used in EPD.